Ready for a “clean” mess? 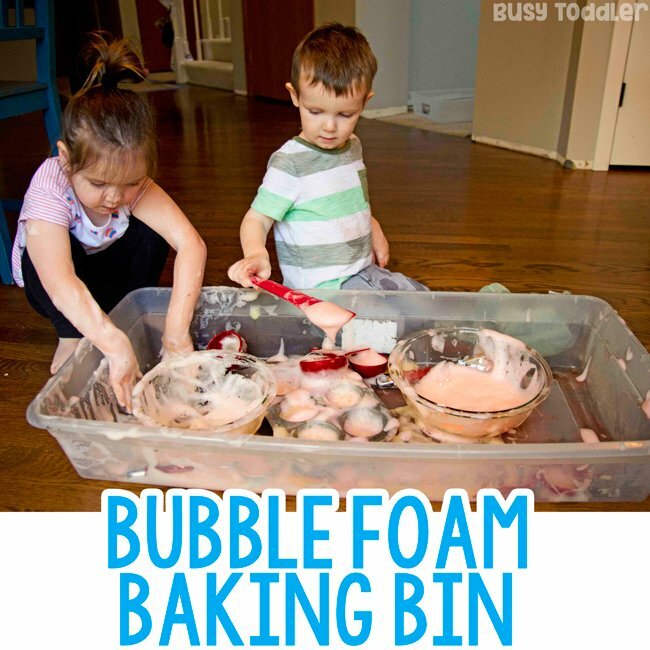 It’s time for a bubble foam baking bin. 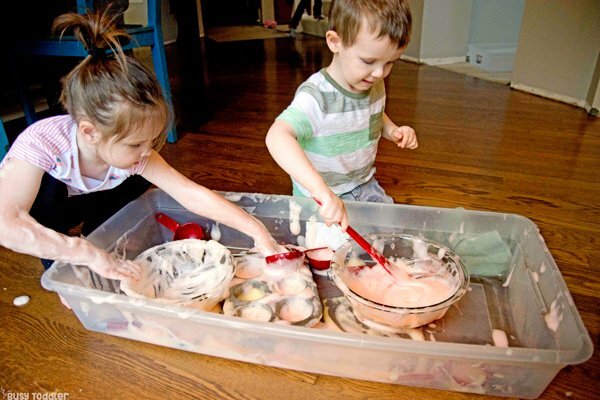 Oh I love a good sensory moment – and nothing is better than a bubble foam baking bin sensory moment because those make the cleanest messes known to toddler-mankind. Wow. That sentence was a mouthful. I could go back and fix it or keep calm and blog on. 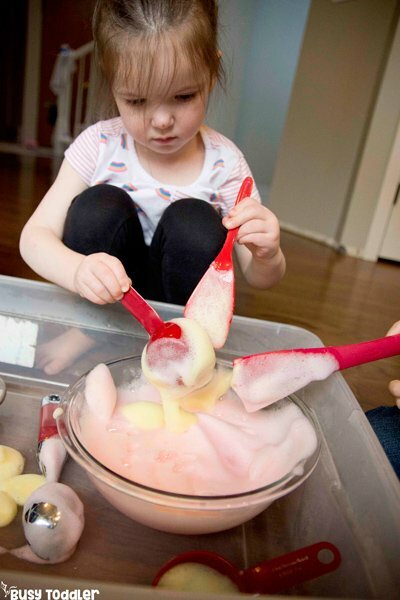 Bubble foam is AMAZING and whenever I make it, I always whisper a THANK YOU into the air to Fun at Home with Kids. That’s where I first learned about the magical powers of bubble foam. RELATED: Looking for more sensory fun? 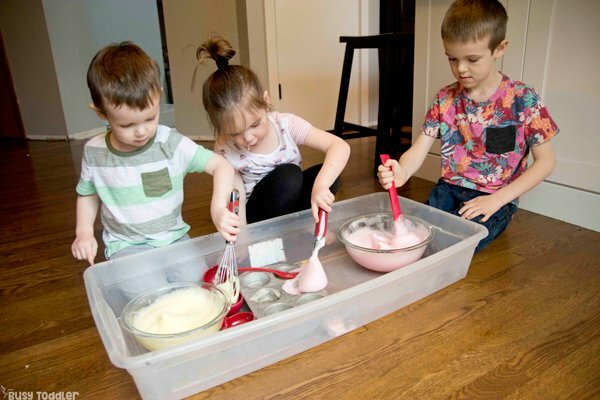 Check out my sensory activities page! 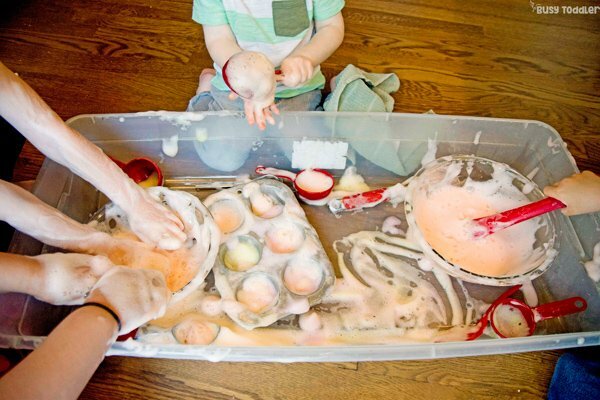 How can this be “clean” and “messy sensory” at the same time? It’s just SOAP AND WATER. So while it may look like a disaster…technically everything in that bin is actually CLEANER than before the activity started so we’ll call that a win. Any of the mess that gets on the floor? It’s like free mopping. Any mess on the kids? It’s like they don’t even need a bath today (lol). That sensory bin? It hadn’t been cleaned good in months so I call this a win for actually adding some soap and water to the situation. To make bubble foam, mix 2-parts bubble bath with 1-part water. For each color here, I did 1 cup bubble bath and 1/2 cup water. If you want this to be colorful, now is the time to add a drop or two of food coloring. Because the food coloring gets super diluted from the water and soap, I haven’t had it stain their clothing or hands. 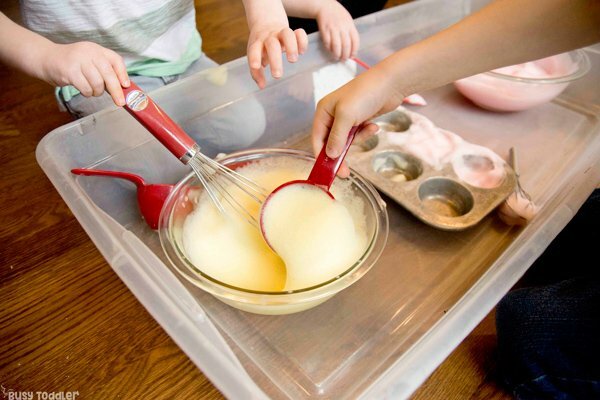 With a hand mixer, blender, and stand mixer, whip the water and bubble bath until stiff peaks form. Think back to making whipping cream or seeing someone make whipping cream on the Great British Bake Off. And just like a wedding dress…you’ll just “know” when those peaks have formed and the bubble foam is ready. 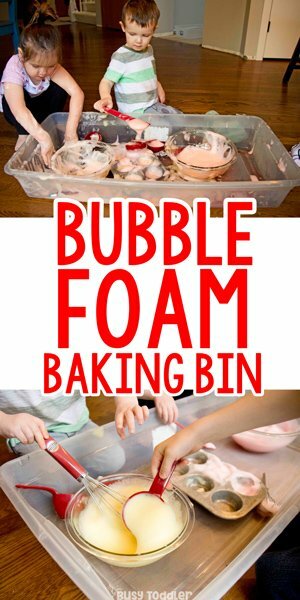 I turned this into a bubble foam baking bin because WHY NOT?! But we haven’t done much imaginary or dramatic play with it and this felt like the right day. 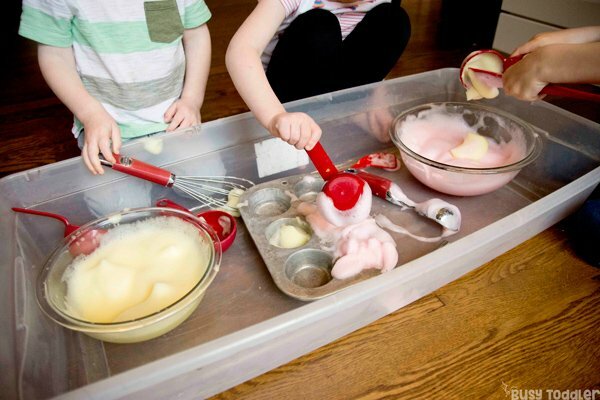 I made TWO batches of bubble foam and set them inside our sensory bin. 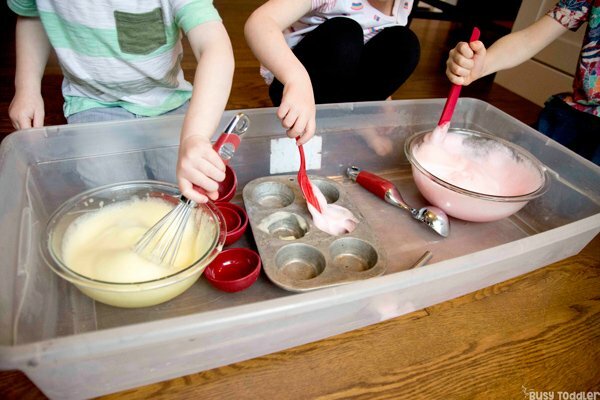 I added in a bunch of cooking supplies – cupcake tins, whisks, scoops, spoons, etc and let my kids create, mix, and imagine. It was a BEAUTIFUL activity to watch because there was so much play and learning happening. My kids are 2.5, 4, and 5.5 in these photos. 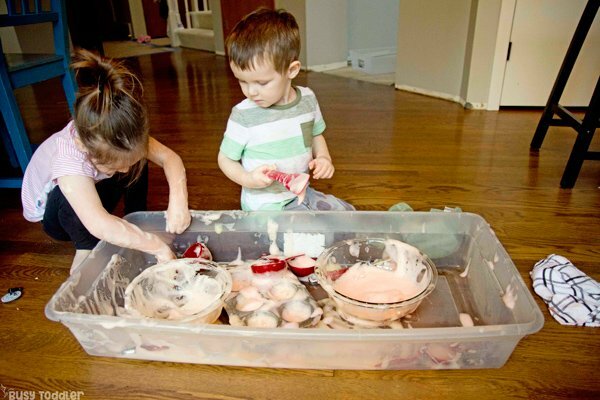 This is an “oh whatever” type activity for me because while it gets messy…remember: it’s a clean mess. 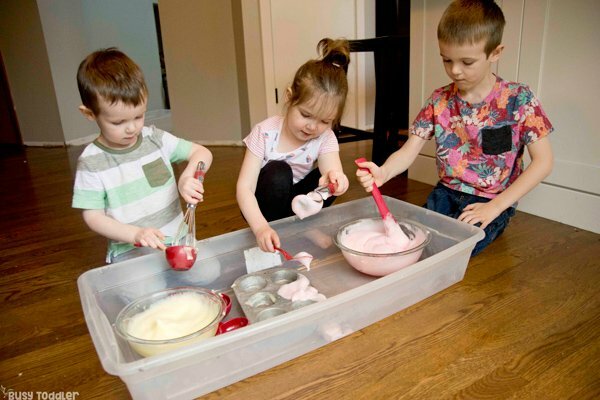 To help keep things under control DURING the activity, I do give out towels and wash clothes as a way to give my kids some control over their own clean or messy hands. I had this vision of how fun this set up could be and man, it feels good to #nailit! I hope you’ll try bubble foam in the future because trust me – there’s a reason we keep on making this stuff. Have you made bubble foam yet?